Happy October, loyal readers! Welcome to Lightrider’s annual Halloween Month, where we spend our time looking at the contributions of horror to the writing toolbox. And to begin this year, we’ll be looking an author whose work has already been profiled on this site, the creator of the Old Ones, H.P. Lovecraft. Howard Phillips Lovecraft was born in Providence, Rhode Island in 1890. He was described as a child prodigy, writing poems as early as six. He also took an interest in chemistry and astronomy (though he struggled with the math needed to be an astronomer). 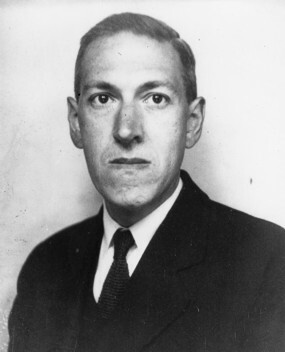 His early life also provided much of the influence for his later work- Lovecraft suffered from night terrors and vivid nightmares, and his father reportedly went into a mental asylum when his son was three. Lovecraft also learned Gothic horror stories from his grandfather, whose death forced the family into financial difficulties (another constant theme of Lovecraft’s life). Lovecraft largely supported himself through his work, which was generally sold to pulp magazines. While at the time given little major fanfare (much like Edgar Allan Poe), much of this pulp is regarded as classic horror, with stories like ‘The Outsider,’ ‘The Thing on the Doorstop,’ and his most famous work, ‘The Call of Cthulu,’ which began Lovecraft’s most enduring creations, the god like aliens known as the Old Ones. Still, these works gained Lovecraft little financial support, and he largely subsided on the support of his wife, Sonia Green. Unfortunately, Green also suffered financial problems, and Lovecraft was forced to reside in the Red Hook section of Brooklyn, which proved a hardship due to its immigrant population (Lovecraft held those of English descent in high regard and this sadly shows in much of his work). Eventually, Lovecraft did return to Providence, where he continued to write with increasingly small returns, until his death from cancer of the small intestine in 1937. There are many constants in the works of Lovecraft. He is largely considered a father of the modern horror story due to his consistent theme of man’s great insignificance in the universe. Perhaps owing to his family history and his love of astronomy, Lovecraft’s tales often involve men stumbling onto great secrets that literally drive them mad (many of his stories are recorded as the last testaments of men in the throws of madness). Tales such as ‘Arthur Jerym,’ deal with the secrets of inherited guilt, while stories like ‘Dagon’ and ‘The Colour out of Space’ show the great horrors of the universe, both from above the heavens, and the remnants left on Earth. Each of these stories show the creeping effects of madness, horrible transformations of mind and body, and that despite man’s knowledge, he is but a grain of sand in the vast and terrible beach that is the universe. For a writer looking to tell a mounting tale of suspense, or simply to keep their reader enthralled, they need look no further then Lovecraft. And for those that look to creating worlds, Lovecraft is also a guide. His most enduring creations, The Old Ones, arguably stand as embodiments of all his themes- otherworldly beings that dwarf man, cause fear that creates madness, and will one day return and undo all of humanity’s work. But they are also an influential mythology onto themselves. ‘The Call of Cthulu’ describes an archeological expedition that uncovers the writings and remnants of Cthulu, including the cult that still worships him, the location his ancient, underwater city, and sets the basis for the creation of the other Old Ones. With this, and other Old Ones tales, like ‘Dagon’ and ‘The Case of Charles Dexter Ward,’ Lovecraft created not only a pantheon, but a sense of an ancient world and it’s people, and a horror that will continue to dog man forever. 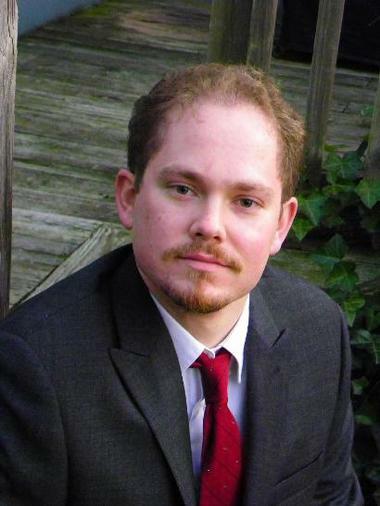 He creates a past and present, and then links the two together forever, some of the finest world building and one authors should strive to look to. The list of Lovecraft’s stories and the works inspired by them is numerous. However, those looking for the complete history should purchase The Necronomicon, a thorough collection of all Lovecraft’s works (smaller collections are also available). From those stories, ‘Herbert West; Reanimator,’ ‘At the Mountains of Madness,’ ‘The Shadow Over Innsmouth,’ ‘Cthulu,’ and ‘The Colour Out of Space,’ are all recommended. Many film adaptations also exist, such as Reanimator, From Beyond, The Haunted Palace (though this is mistakenly thought to be based on Edgar Allan Poe’s poem) and the anthology Necronomicon. Many films have also been inspired by Lovecraft- the Evil Dead series contains its own Necronomicon, and John Carpenter’s In the Mouth of Madness is heavily inspired by Lovecraft’s work. So go find your own way in, but don’t stay too long. We have more to dig up next week. Greetings from the boneyard as we celebrate All-Hallows Eve. Tonight, we head into the past for one of the earliest examples of horror in the last century, horror made with ink and pen and paints for children of all ages. Today, we end October with a look at the grand history of horror comics. Horror comics can be traced back to the early 19th century in America, with Prize Comics’ “New Adventures of Frankenstein” widely considered the first of the genre in the States. 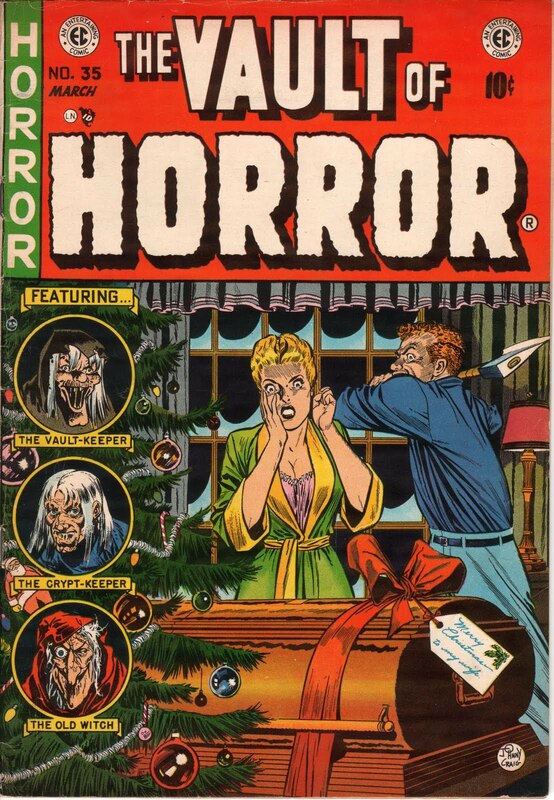 While many other publishers produced such books, the most well known was EC Comics, and its three series Haunt of Fear, Vault of Horror, and Tales From the Crypt. These comics reached a massive high in the 1940’s, with famous artists such as Johnny Craig and Reed Crandall writing and drawing the frightening tales. Unfortunately, these books also experienced a tremendous backlash as parents of the time preached on the bad influences of horror and crime in comics. Dr. Fredric Wertham also published Seduction of the Innocent, which claimed that violent caused children to be violent, painted the comic industry as a shadowy, Mafia like operation, and even pointed to Batman and Robin as propagating homosexuality. In response to the claims (which were based on largely undocumented anecdotes), the Comics Code was formed, which put a ban on many of the essential details for horror and crime comics. As a result, most horror comics faded away, though some were repackaged under sci-fi and mystery. However, horror comics did find their way around these guidelines, and in the 1970’s the code did relax enough to allow Marvel to create the vampire Morbius, and even their own version of Dracula. Alan Moore also had great success at DC resurrecting the Swamp Thing and modern comic writers have found success with characters like Hellboy, and series like 30 Days of Night, Deadman, The Midnight Sons, and Marvel Zombies. While many horror comics were generally simple horror tales, their influence has allowed for much of the creativity in comics today. Without their influence, it is unlikely their would be much, if any, supernatural influence in the comic world today, or any real seriousness. Indeed, many look at the Silver Age of Comics (done under the Comics Code), as one of over the top stories, with such gimmicks, as Lion-Headed Superman, and Bat-Baby (really. They both happened). Even a long lived character like Batman suffered without the elements of those early horror comics, becoming farther and farther removed from his grim beginnings until the 70’s and the loosening of the Code. Because of that, comic writers today have further freedom and creativity to weave not only frightening tales, but to explore darker, more serious elements that challenge readers instead of merely satisfying them. Welcome back to the literary graveyard, as we continue our Halloween journey. Today, we take on one of an American horror legends, located in the Hudson River Valley region of New York State. In particular, a small village that plays host to a story of death, ghosts, and mystery- Washington Irving’s The Legend of Sleepy Hollow. Familiar to many, Sleepy Hollow is the tale of Ichabod Crane, a schoolteacher that journeys to Sleepy Hollow and pines for the hand of local beauty Katrina Van Tassel. However, Katrina has another suitor- Abraham ‘Brom Bones’ Van Brunt, who delights in pranking and frightening the superstitious Crane. Then at the Van Tassel’s autumn party, Van Brunt spins the tale of the local ghost, the Headless Horseman, a Hessian solider decapitated by a cannonball, and who now rides the countryside looking for his head. Crane is frightened by the story and later leaves the party, presumably after being rejected by Katrina. On his way home, he runs across the Horseman, and endures a panic filled ride to the Church bridge, which is supposedly a barrier to the Horseman. However, the Horseman hurls his flaming head at Crane, who is never again seen in Sleepy Hollow, with many wondering what became of him. One of the most fascinating things about Sleepy Hollow is its ambiguity. For example, none of the main characters are purely likeable. Ichabod is depicted as an overly strict and moral teacher, but a glutton in his private life, who desires Katrina as a way to access her father’s vast fortune. Van Brunt is a local hero, but a vicious prankster and a bully in many depictions. Even Katrina is hinted to be only interested in Ichabod to make Van Brunt jealous. Each character is genuinely flawed and imperfect, which makes who is likeable up to the reader. However, that ambiguity also extends to the story itself. Nowhere is this more seen then in the final fate of Ichabod Crane. While it is plausible to believe Ichabod was spirited away by the Horseman, the story also suggests that he escaped and left the town to become a judge in another county. But it is also suggested that his spirit haunts the area. However, the strongest suspicion is placed on Van Brunt, who was described as an agile rider. The story mentions that he always had a knowing look upon his face when the tale was told, hinting that he dressed as the Horseman to frighten off Crane and get Katrina (whom he does marry). What actually happened is left up the reader, and with all the options seeming plausible, the terror of not knowing the truth makes the tale even more frightening. Of course, no discussion of the story would be complete without the famous chase. Irving wisely builds the section to pulse pounding intensity, beginning with the superstitious Ichabod traveling down a dark road, the ghost stories of the party still ringing in his ears. As the Horseman approaches, Crane demands for his identity, until the ghoul’s frightful visage is revealed. Crane runs off, pushing his horse to the limit as he races for the bridge, the Horseman in pursuit. Crane reaches the bridge, but turns just as the Horseman hurls his flaming at him, ending the chase so suddenly, the reader is left drenched in sweat, stunned into shock and uncertainty, elements that all great suspense stories should. 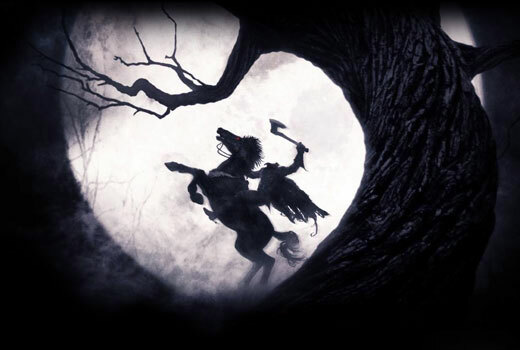 Sleepy Hollow has been adapted many times in film and television. The Disney adaptation is best for younger viewers, as it maintains a fine balance between Disney charm and frights. Older audiences would be well served by Tim Burton’s Sleepy Hollow, which is loose with the story (Crane is now a NYC constable, called in to investigate the Horseman) and adds a compelling murder mystery and well done gore element, while still paying homage to the original story. The TV movie The Hollow is also a fine choice- a sequel of sorts that deals with The Horseman returning for the descendants of Ichabod Crane, with many dark and genuinely frightening elements. Finally, there is the current TV series Sleepy Hollow, which resurrects a British turncoat version of Ichabod Crane in the modern day, along with the Horseman. While it expands on the story, adding Biblical, historical, and mythical elements as well as a modern crime drama, it is still an enjoyable and fun version, good for anyone looking to expand on the original story. Come back next time for our final unearthed grave, one filled with ink and paint and plenty of ghouls…. Greetings and Happy Halloween season to you all. I’m returning to the blog to kick off a favorite tradition- the October reviews of horror classics in literature and film (which will have increased entries to make up for their late start). To kick things off, we examine a horror masterpiece that is currently seeing a revamp in the theatres- Bram Stoker’s Dracula. Jonathan Harker, an English lawyer, travels to the mountains of Transylvania to finalize the sale of Carfax Abbey to the enigmatic Count Dracula. As Harker’s stay becomes further extended, he slowly begins to realize that Dracula is an undead vampire that has terrorized the region for decades. Harker is able to escape, but is unable to stop the Count’s journey, as he reached England and begins a new reign of terror. As he attacks Harker’s friends, they band together and with the help of Dr. Van Helsing, work to stop the vampire, who has begun to turn Harker’s fiancée Mina. Dracula has gone through countless revisions and rebirths over the years, but they often overshadow the brilliance of the original text. To begin with, Stoker uses Dracula in a way that is often forgotten by the horror films of the modern day- he has little actual time in the novel. The story is told as a series of journal entries from Harker and other sources, and we see a much greater view of their world then we do of Dracula’s, save Harker’s early writings in the castle. However, Dracula himself hangs over each page, an invisible presence fueled by the reader’s knowledge of him, and the characters’ growing fear. This builds him into a much greater force, painting him as a force of tremendous evil, but leaving his exact nature to the reader’s imagination, which makes fearful to all, but in a very individual way for each reader. However, there are aspects of Dracula that are clear, and those are the moral and even sexual undertones the character and vampirism bring to the novel. After all, Dracula lives with three brides that attempt to seduce him before biting him. 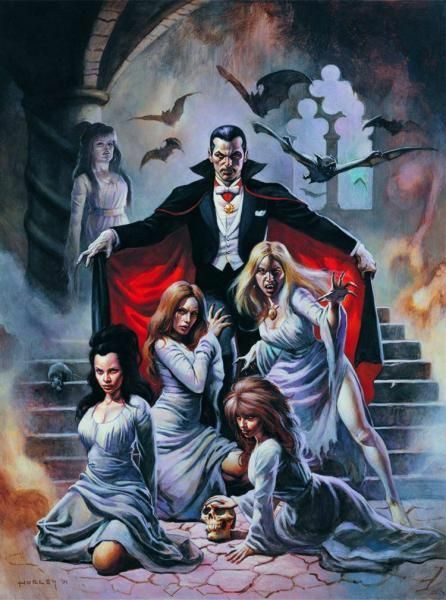 And the fact that Dracula’s victims are all women, who become more and more enamored of their escapades as his power over them increases. It paints Dracula, and vampirism itself, as a sexual temptation, a force that would speak volumes in Victorian London. Both are seen as a sense of freedom, of release from society and all else. But the cost is high- continual murder and the loss of one’s soul. It is no surprise that the affected characters struggle to hold on to themselves even as their vampirism increases. They know that while their new desires whisper of freedom, they come at the cost of their very souls and morality- often the price for an overabundance of freedom and what makes Dracula so very dangerous. As mentioned before, there have been countless adaptations of Stoker’s work. However, fans of the silver screen are required to view Universal’s original Dracula, with Bela Lugosi’s career making performance. Another excellent entry is Hammer Film’s Horror of Dracula, which is loose with the original story, but holds to the spirit of the novel, and contains some effectively seductive and horrifying scenes (as well as an original death scene for Dracula). Francis Ford Coppola’s version is best for a pure adaptation, though it adds its own romantic touch that still works with much of the original plot. And there are several group monster films that feature Dracula in a fine light (Monster Squad, Abbott and Costello Meet Frankenstein). However, fans should avoid the 2009 book sequel, Dracula Un-dead, which is written by Stoker’s great grandson and a film writer, which retcons much of the novel and is largely seen as an attempt by Stoker’s family to reclaim the Dracula name (which has long been in public domain). And as for the current revision film, Dracula Untold? Skip it. Just skip it. Greetings once again, frightful readers. We’ve been going over horror stories all this month, and seeing as how today is All Hallows Eve, it seems fitting to head back to the crypt to unearth one more story. Of course, as I said last week, this is a story that’s a little hard to find. It could be anything- your dog, a bug, even YOU, reader. And no one would ever know until it was too late; for that is the power of today’s entry, one of my all-time favorite horror films- John Carpenter’s The Thing. A remake of the 1950’s horror film, The Thing From Another World (itself an adaption of John W. Campbell’s Who Goes There), The Thing takes place at an Artic research base, which is suddenly invaded by a stray dog and a pair of Norwegian scientists trying to kill it. The Americans kill the scientists and take in the dog, then travel to the Norwegian base. There, they find a ruined building, and a horrific, two-headed human corpse, along with a long hollowed out block of ice. They realize the Norwegian scientists unearthed something in the ice, which is made readily apparent when the new dog mutates into a horrific creature. They subdue it, but realize the alien creature can perfectly adapt into another being, and even a cell can make a perfect replica. The men slowly devolve into paranoia, as they realize that the creature may be posing as one of them, and must be prevented from infecting the rest of the world. While much of what makes The Thing a success is it’s special effects, which are gruesome and yet amazing to behold given the limitations of the time, that same success is equally due to the film’s excellent setup. Placing the film in the Artic gives us a sparse, empty environment with no connection to the world at large. As such, when the Thing begins its attack, we know that no help is coming, and even if it did, it probably wouldn’t reach our heroes in time. Therefore, it is up to our small band of men to contain and eradicate the Thing before it can return to sleep, or infect the civilized world. However, there is one thing that is preventing them from doing so- each other. Remember, the Thing is capable of perfectly imitating any living being, including humans. Therefore, the men are highly suspicious and paranoid of each other, heightened by lack of sleep. This means that even the slightest hint of an impersonation is met with open hostility- MacReady, the main character, is left outside in the cold when a torn jacket with his name is found. When they attempt to perform a blood test to check for the Thing, the blood samples are destroyed, leading to suspicion of all those with access to the med lab. One man is even shot and killed because of the rampant paranoia without showing any signs of infection (he is later proved to be fully human). And since the audience has no idea which, if any, of the men are infected, we feel that same fear and paranoia, which heightens our fear, and our reactions when the Thing does reveal itself. Still, the movie wisely avoids any chance for a sequel (and as proved by the 2011 prequel, no additional story is required) with its ending. Here, we have a rather nihilistic conclusion that still manages to keep our questions and paranoia going. With the destruction of the Thing, the base, and the majority of the crew, we are left with MacReady and fellow survivor Childs sitting in the ruins of the base. They cannot prove that either of them is not infected, but it is a moot point, since without shelter, the freezing temperatures will kill them before any rescue team arrives. Therefore they sit facing each other, taking their last drinks, as the film ends. It is a dark and chilling ending, and leaves many questions unanswered. But regardless of whether or not the Thing still exists, it is frightening to believe that these two men will be rewarded for saving the world by freezing to death. Of course, the viewer will also wonder if they are even still men, and whether a rescue team would unleash a greater horror by saving them. 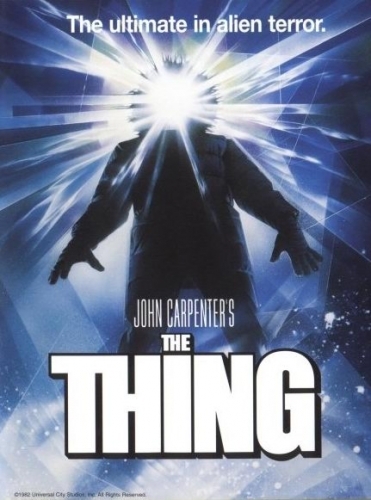 The Thing has received many adaptions over the years, but minus the afore-mentioned prequel, it still stands as a sci-fi tale with Hitchcock level suspense. Even without the effects, the idea of men cut off from civilization and facing an evil that they cannot see is more than enough to drive the story. Writers can easily take the suspense and paranoia and its effects for various other stories, such as thrillers, adventure, and obviously straight horror. But perhaps the ending offers the greatest lesson. In too many stories, major problems are resolved with a forced happy ending. This serves as a reminder that, just like in life, characters can do everything right, save the day, and still die as a result. But the fact that MacReady and the others accept that, helps makes this ending even more memorable, and even more chilling. Well, that’s the last coffin for this year. I hope you’ve enjoyed our trip around the graveyard, and don’t be afraid to pick up any of the stories I’ve mentioned (either the original or this version of The Thing are excellent films, though the suspense and effects drive each differently). And remember, tomorrow is the start of the Lightrider Giveaway contest, so be sure to use the Lightrider Facebook page to enter. Happy Halloween! Welcome back, as we pop open another coffin, and peer inside for some more ghoulish writings. 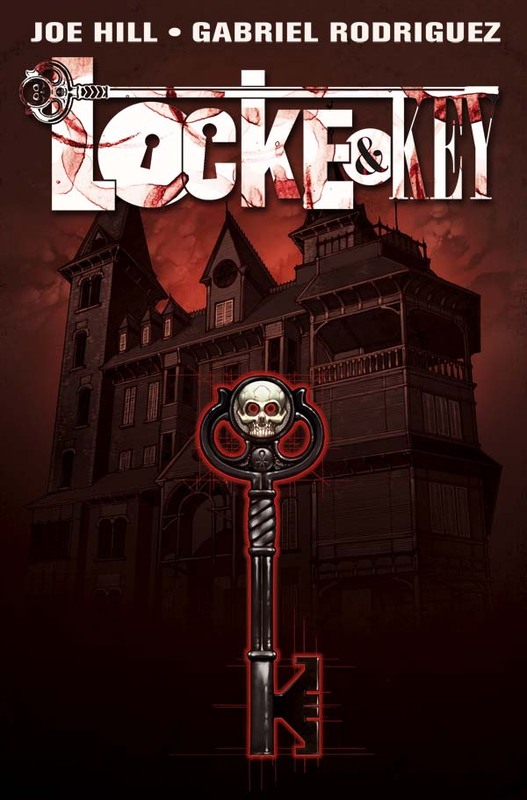 Today, our work takes us into the dark world of Lovecraft, MA, and the haunted Locke family estate, in the world of Joe Hill and Gabriel Rodriguez’s graphic series, Locke and Key. Note: This review will only focus on the first four volumes of LAK, as I haven’t not yet finished the series. Locke and Key is the story of the Locke family (mother Nina, and her three children, Tyler, Kinsey, and Boyd). After the gruesome murder of their father, the family moves to their ancestral home of Keyhouse in the town of Lovecraft. There, the children slowly uncover the dark secrets of their house and their father’s past, as they discover magical keys scattered throughout the house. Each key holds a special power (separating a spirit from its body, erasing memories, controlling shadows, and switching genders). But the children are also hunted by a boy named Zach and a creature called the Dodge, which both seek the house’s greatest secrets- The Omega Key, and the Black Door, which combined will release all the demons of hell. Locke and Key might be based in magic and supernatural forces, but its greatest strength is its strong characters. The Locke family is a group of people that manages to grab sympathy and disgust from the readers. Nina is a self-pitying alcoholic, still mourning the death of her husband, which has damaged her relationship with her children. There is an especially dramatic scene where Nina finds a key that can repair damaged objects, and attempts to use it on her husband’s ashes. The resulting failure causes a further rift between her children and herself, as the readers both pity her and are disgusted by her inability to move on from her grief. But ironically, that grief has had both a negative and positive impact on her children. While all three still suffer from their father’s murder (Tyler feels guilt over their last conversation, Kinsey cannot forget the fear she felt while hiding from the murderer, and Bode is simply too young to fully grasp the growing rifts in his family), it also causes them to bond. When Bode proves the power of the keys to his siblings, they are quick to work together to find a solution (albeit with some misuse- Kinsey uses a key to literally remove the emotion of fear, Tyler tries to impress a girl with another), they work to keep the keys safe and protect each other when the Dodge begins to attack. Because of this, we are given glimpses of real family drama mixed in with the supernatural for a more memorable and gripping tale. Of course, the supernatural element needs to be as strong as the characters, and we are certainly given that with the mystic keys. Not only are the keys’ powers unique (how many stories have a key that can make someone a giant, or make music into an irresistible suggestion), but they are the driving force of the whole story. The children discover the keys one by one around the house, and there is never a pattern or reason to their discovery. For example, the Giant Key is found as part of the floor in one room, while the Animal Key is found in a frozen birdbath. So every story brings the chance of new discovery. But at the same time, the keys unlock more than new powers; they work to unlock more of the puzzle of their origins. Through their dealings with Zach, The Dodge, their schoolmates, and their exploration of the house, the children learn that their father was part of a group that originally dealt with the keys and was responsible for sealing the door, scattering the keys, and imprisoning the Dodge. So in discovering the keys and dealing with the Dodge, the children are also presented with a rare chance to connect with their father after he has passed on. However, that mystery is made more urgent by the constant threats the keys place on their lives, so this is a mystery that must be solved on pain of death and the end of the world the price of failure. While LAK might not be an outright horror story, it never shies away from blood and gore in its mysterious tale, without resorting to slasher-level madness. Instead, it brings together family drama and a supernatural drama, linking them so that one simply does not have impact without the other. This makes for a rich story that can demonstrate both genres effectively, appealing to authors that desire tales of the paranormal, or of a family in pain learning to piece things together. It also shows a talent that every writer should try for- creating a story that can weave itself slowly and effectively. A good horror film makes the viewer addicted- needing to watch for the horror and being unable to turn away, no matter how long it takes. Poor horror films, like poor stories, make the horror obvious, with no questions for the viewer expect for when something will pop up. LOK unfurls its dark wings slowly, entrancing us not only with horror, but a family in turmoil and a supernatural mystery to boot. Next week, the Halloween series comes to end, and to close the crypt, we’ll be reciting a few childhood stories. But these stories removes the sparkle and adds some long removed blood. But until then, children of the night, enjoy the music. Welcome back to the graveyard, as Points of Light continues our Halloween journey. As promised, this week focuses on the tale of a prom gone to hell, in both written and cinematic form. So, in honor of it being a classic horror tale and experiencing a movie remake, let ‘s open up this week’s entry, Stephen King’s Carrie (because we all knew I’d put a King story in here SOMEWHERE). 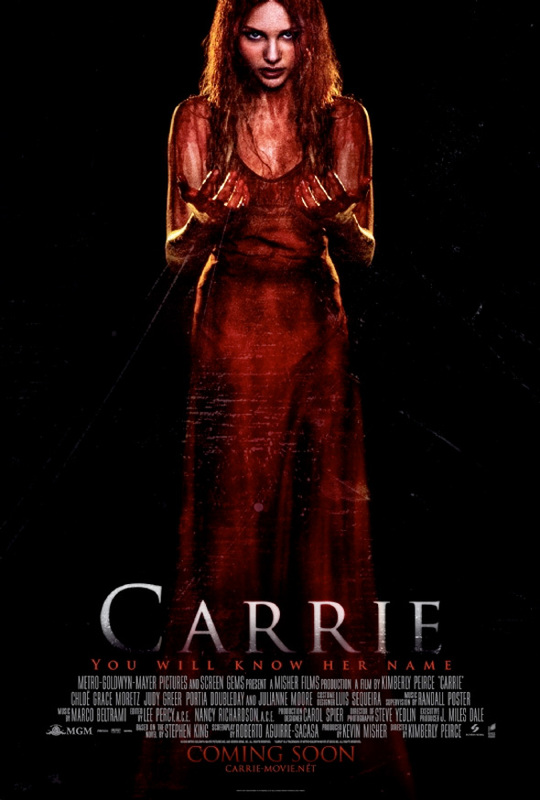 Carrie is the story of Carrie White, a teenage girl that suffers humiliation on a daily basis. Her mother is a dangerously devout Christian, which has caused Carrie to grow up as a social outcast. Carrie is mocked by the other girls for her appearance and lack of social cues and know-how. This eventually comes to a head one day in the girl’s locker room, where Carrie has her first period. Unaware of what is happening, Carrie panics, thinking she is bleeding to death. The other girls respond in a brutal hazing incident that is simply too disturbing to repeat here. However, this traumatic event reveals a long dormant talent in Carrie- she is telekinetic, able to move things with her mind, albeit with physical exhaustion. As a result of the incident, the girls involved are punished, with one feeling guilty enough to have her boyfriend take Carrie to the prom. However, the one girl that refuses the punishment (and is subsequently banned from the prom) plans a final humiliation for Carrie, that shatters the girl’s already frail psyche and sets her off on a slaughter-filled spree against everyone that ever wronged her. What truly makes Carrie memorable isn’t just its climatic prom scene, but rather the stark reality behind it. High school is a dog-eat-dog world for everyone, with the weak always getting eaten alive. There is not a soul that never felt isolated or mocked during that time, usually for something they couldn’t control. Carrie White is the embodiment of that; even King describes her as a girl “you just wanted to yell at.” Because of that, we immediately feel sympathy for her, because we remember how it felt to be ridiculed ourselves, and how we fantasized, however briefly, that we could get back at our attackers. And the story ups the ante by not just making the high school girls the tormentors, but Carrie’s own mother. This is a woman so wrapped in her religious mania that she neglected to tell her own daughter about menstruation and locked in a closet for committing ‘the sin of blood’ afterwards. She treats Carrie as a living bomb, waiting for the day her daughter will give into her sin (use her power). Carrie as a character grabs us because while we may not live in her world, we have all been there in some way, and we remember how much it hurts. Because of that connection, the novel is able to build a unique type of suspense. When Carrie is asked to the prom, it is a catalyst that begins to build Carrie’s confidence. Coupled with her increasing powers, Carrie starts to break away from her mother and become more independent. Because of the established connection, we want her to succeed. But at the same time, Chris, the antagonist, is plotting something horrible for Carrie at prom. In the book, King uses flash forwards to testimony that establishes Carrie’s rampage started at the prom, while the movie simply shows Chris planning. Either way, the reader is praying it fails, as we watch Carrie start to emerge from her shell and actually have fun. Even at her moment of glory, which is when Chris’s revenge happens, we’re still trying to ignore the signs, ignore the horrible fate that we know is coming because we’ve almost become Carrie at that point, seemingly over everything that tormented us. And when the horror finally does happen, and that fantasy is ripped away from Carrie and from us, it makes her into something unique- an angry, revenge filled monster that we are actually cheering for. I can recall even yelling, “YES CARRIE, BURN THEM ALL!” when I watched it. And to make a murderous rampage seem sympathetic and for an audience to cheer for it, shows a level of character and emotion that only a truly skilled writer can pull off. Carrie is certainly a revenge fantasy, but one that is easily relatable to anyone. It is horror that works because it strikes us at home. Carrie’s experiences are horrible, but there is an element that we have all experienced. It is why readers cheer for her, and yet at the end , we question why we did. The truth is, this is a novel that frightens not only because of its reality, but also because we wonder, if one of us had that kind of frightening power, how would we use it? Would we go as far as Carrie, and would we be right to do so? And finally, just because someone commits an act such as this, is it entirely their fault? In today’s world of school shootings, and strident anti-bullying campaigns, it is a question worth asking.